The stars at night are big and bright, deep in the heart of Texas—State Fair, where a refreshed 2019 Nissan Titan and Titan XD pickup truck each made their debut Thursday. A mild refresh of the popular truck brings new technology features, adding polish and refinement to the Mississippi-built truck. These refinements include a Fender premium audio system and a standard seven-inch touchscreen. The new infotainment screen comes equipped with a higher resolution display and Nissan Connect Services, including much-needed support for Android Auto and Apple CarPlay. Another move that will be welcomed by everyone in the modern world is Nissan's decision to increase the number of USB ports from a lonely one to a total of four. 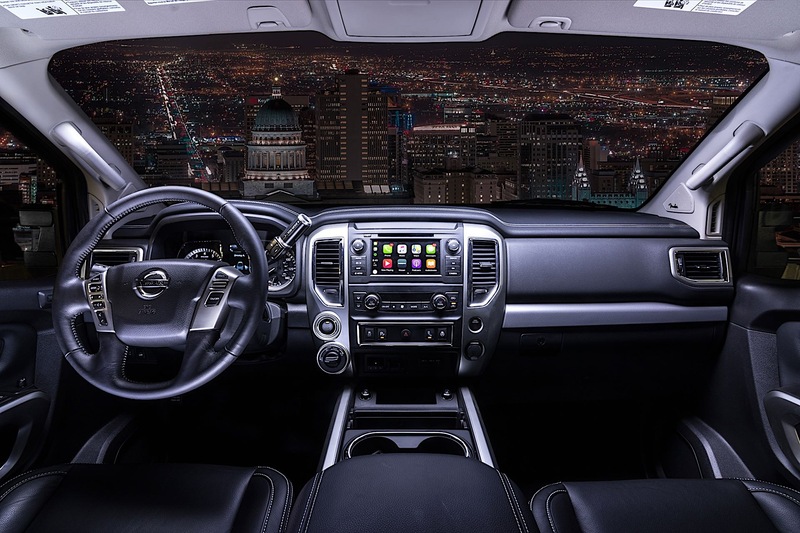 Interior of the 2019 Nissan Titan. Improving safety is important to Nissan, so Titans equipped with four doors feature Rear Door Alert technology. If the system detects that the driver might've left something or someone in the rear seats, it'll display a message and play an audible tone. 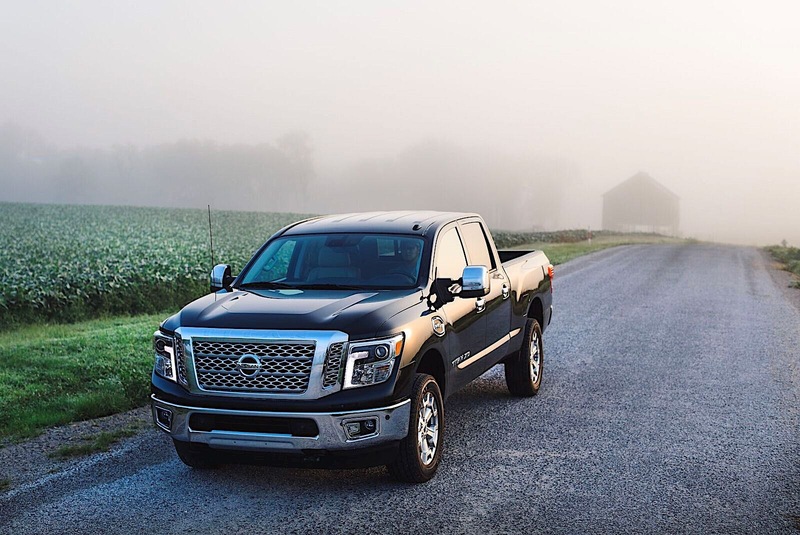 The Titan, Nissan's full-size truck offering in the United States comes standard with a 5.6-liter V-8 that makes 390 horsepower and 394 pound-feet of torque. For those who need more capability, a heavier-duty Titan XD can be optioned with a 5.0-liter Cummins diesel V-8 with 555 pound-feet of stump-pulling torque and 310 horsepower. “The 2019 TITAN will be our most refined truck yet,” Nissan VP of trucks Fred DePerez told The Drive at the State Fair of Texas. “In addition to being the traditional workhorse in the stable and hauling cargo, pickups today are used for hauling families – the most precious cargo of all. With Nissan’s Rear Door Alert system, Titan drivers can feel even more confident whenever they leave their truck,” he added. New exterior colors are also making their way to the Titan for 2019, such as Moab Sunset (pictured) and Midnight Pine. Additionally, fans of the Midnight Edition trims will be happy to know that it will carry over to 2019 model year trucks. One additional update that's specific to the Cummins diesel-powered 2019 Titan XD is that the Diesel Exhaust Fluid (DEF) tank is now larger. DEF is required by law to make sure the emissions from the truck are less toxic. 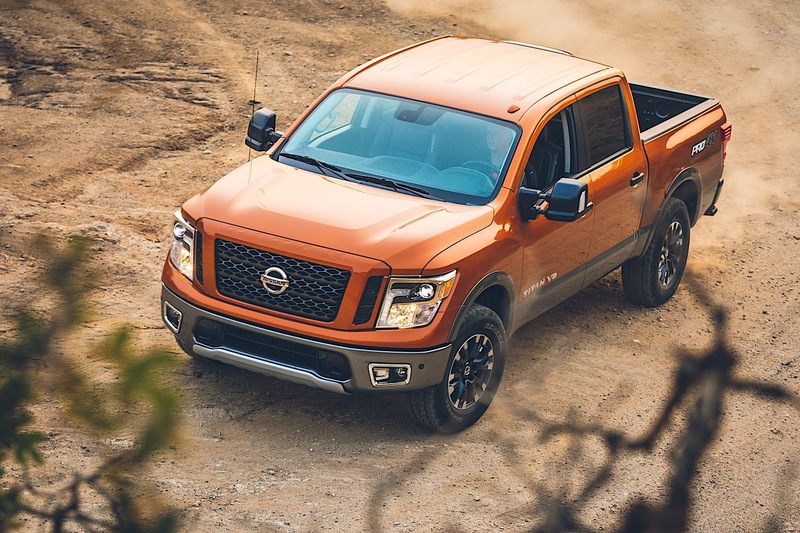 Pricing for the new trucks isn't currently available, but Nissan's senior manager of product planning Brent Hagan said that Nissan "intends to maintain its value proposition with the best warranty in the segment." Twelve speakers and a 485-watt amplifier replace the outgoing Rockford Fosgate hardware. The chef-approved pickup will tour four U.S cities before making its smokin' debut in the Smoky Mountains.